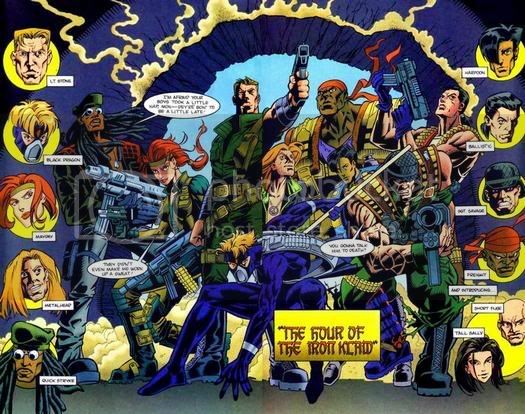 GI JOE EXTREME VOLUME ONE COMIC REVIEWS- BLOOD FOR THE BARON!!! 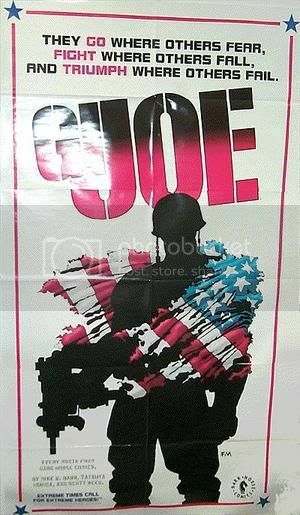 Here is the GI JOE COMIC Promo Poster that was made available for comic shops to display, its the cover of issue one with some extra pretty cool writting on top. So with-out further ado here are the reviews for the GI JOE Extreme VOLUME ONE comic (with pictures!) done by the fans, with some slight changes by me, the original link can be found here at this site http://www.geocities.com/thefreighter89 ... reme0.html --- but there is no pictures its just text. So Scans of actual pages of the actual comics will only be here on this site. G.I.Joe! The full team, including Stone, Freight, Black Dragon, plus Sgt. Savage, May Day, Metalhead, Har.poo.n and Quick Stryke, make their presence known. Iron Klaw immediately takes the Professor and flees the scene, leaving, as Har.po.o.n notices, â€œonly about a hundredâ€ skull-masked troops to deal with the Joes. Stone orders Savage and Freight to help with the cannon fodder while he worries about Iron Klaw. Freight shoulder checks a troop so hard, it cracks the wall behind him. Black Dragon gives May Day the first shot, gentlemanly as can be, but May Day refuses, saying sheâ€™s no lady. Out in the sewers, Iron Klaw is taking Professor Reyland to his craft. But two new Joes have entered the picture, and tossed a gas grenade at the baddie. Disoriented, Iron Klaw cannot stop Short-Fuse ( no connection to Short Fuze from the original GI JOE TEAM ) from snatching the Professor away, and meeting up with Tall Sally, to keep Iron Klaw away. Iron Klaw pulls a gun and takes aim, but the gun is blown from his hand by a shot he calls, Impossibleâ€! The marksman extraordinaire, Ballistic, remarks that itâ€™s â€œNot impossible, Iron Klaw - Not even real hard!â€ Iron Klaw slips away as the other Joes arrive on the scene. Professor Reyland thanks the Joes for saving him, but Lt. Stone gives the credit to Metalhead, the electronics expert, for the microtransmitter he placed in the Professorâ€™s glasses. Stone then congratulates Short Fuse and Tall Sally for their work, and welcomes the new recruits to the team. Sally finds herself in Metalheadâ€™s arms as he comments that theyâ€™ve all earned some R&R. But Stone reminds them they have a debriefing first. Back at the G.I.Joe base, the Joesâ€™ Commander-In-Chief, Mr. Clancy, commends the Joes for their efforts, and tells them theyâ€™ll be staying in Europe for a while. Professor Reyland will publicly unveil the Ferti-gel at an Inter-alliance conference in Kalistan, where the Joes have been for some time, it seems. The Joes are to keep the Professor safe, when Iron Klaw surely strikes again. Clancy reveals that heâ€™s chased the leader of the SKAR organization since the 1970â€™s, and that Iron Klaw is obviously being groomed as SKARâ€™s next leader. Clancy wants him out of action, and all of SKAR with him! Black Dragon inquires to Clancyâ€™s age, but the man in black shuts him down. When Harp.o.on questions how security will be handled, Clancy introduces the ruler of Kalistan, and InterAlliance member Count Alaric VonRani. VonRani is a suave ofoâ€™, and immediately makes with the gentlemanly greetings with MayDay. Sally warns her fellow female Joe about smooth European men, but MayDay hasnâ€™t been effected. Her idea of â€œclose and personalâ€ is a one-on-one battle with Iron Klaw. Clancy reminds the Joes that stopping SKAR is the reason the organization was created. The Joes promise not to let him down! At SKARâ€™s secret headquarters, Iron Klaw apologizes to the SKAR leader, the Dutchess of Mklavia. She shrugs off the failure as attonable, and reminds Iron Klaw how he rose to become the best of her students, by â€œdestroyingâ€ the competition. Her plans are to gain control over her homeland, as was her royal birthright before European politics shifted to Democracy, and public rule. Iron Klaw pledges they will see her dreams come true! Back at GIJOE headquarter, MayDayâ€™s practicing on the shooting range. Ballistic tries to give her some pointers, but she tosses him across the room, and storms out. MayDayâ€™s just not that type of girl. Har.poo.n remarks that Ballistic is as much â€œa fish out of waterâ€ with MayDay as Har.poo.n is on land. In his quarters, Short Fuse is talking with his wife over a video-phone. She tells him, â€œThe baby moved again Bensonâ€, to which Short Fuse admits he â€œcanâ€™t wait to get home!â€ Stone steps in and calls Short Fuse out for the, mission. At VonRaniâ€™s formal reception, Sally is thrilled to be in such regal company, looking so pretty and important. MayDay, as usual, is not happy with the situation. Stone wonders whatâ€™s taking the Count so long, but Clancy assures him theyâ€˜re just waiting for the honor guard to announce him. Outside, Iron Klaw and his troops take out the honor guard, and take their places. Clancy calls Metalhead and tells him to bring the Count in. But Stone sees the boots on the honor guard arenâ€™t regulation, and makes a mad dash to Count VonRani. Still in disguise, Iron Klaw snatches up the Count, and steals away during the firefight. Sgt. Savage is caught off-guard by the unexpected battle, but Ballistic, ever the boy scout, hands him a pistol. Alone with the Count, Iron Klaw reveals his true form, and aims his gun at the Countâ€™s head ! Back at the reception, Freight effortlessly hurls two SKAR troops above his head, slamming them together. The Joes are successful, and the SKAR forces are forced to retreat. They duck into the same alcove that Iron Klaw took the Count. Inside, they find an already dead VonRani with a bomb strapped to his chest. The bomb explodes, incinerating the remaining SKAR troops. When the Joes arrive, they find a more-or-less unscathed VonRani calling for a rescue. The Joes pull him up, happy to have him alive. But in the shadows, the steel mask of the Iron Klaw is still visible under the guise of the Count! Commentary: Hasbro really took the time to develope some really interesting characters and the comic starts to really make use of the characters Hasbroâ€™s worked up for them. Between Ballistic, MayDay, and Mike Richardsonâ€™s original characters Tall Sally and Short Fuse, we got a lot of characterization, and promise of a story to come. Immediately, we see the motivations of the bad guys, and a lot of back story being hinted at. Iron Klaw and VonRani were planned from the beginning to be the same person, but while the cartoon used that mystery as the main point of contention in the first season, the comic goes back to the root of that correlation, letting us see that Iron Klaw actually *killed* the real VonRani and took his place right under the Joesâ€™ noses. This is the first step in Iron Klawâ€™s break from the Duchess, which concludes in Issue #3, when he claims SKAR for himself. This is really the story at hand in the miniseries. This is the story of how the status quo we will see in the regular series came to be. i love the frank miller cover, never picked this up when it was originally released tho.